Vermonters are using FPF to seek and provide assistance. They rally together to support each other in times of need. Today we celebrate the wonderful example of the accomplishments possible by the folks in Westford! Using Front Porch Forum to post to their neighbors, co-founders Lauren and Julia built a community asset that is still going strong today. 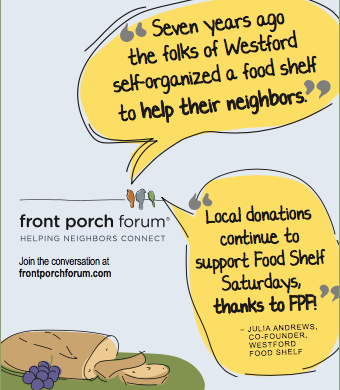 In November, 2007: “I just found out that Westford doesn’t currently have a foodshelf in operation. I’m very interested in starting one up again and am looking for some help. I’m doing research now on what tasks and costs are typically involved. Also on possible locations to host distribution and storage. It would probably only need to be open for two days or so toward the end of each month.